The convergence of Internet Protocol (IP) networks is enabling seamless communications that combine data, voice, video and other information streams. The true value of converged IP network however is realized through the converged applications that leverage the network. The key enabler to developing converged applications is the platform for designing, developing, testing, and deploying applications that integrate and compose services. 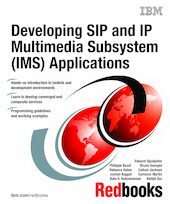 This IBM Redbooks publication introduces IBM tools for creating converged Session Initiation Protocol (SIP) and IP Multimedia Subsystem (IMS) applications. It provides programming guidelines and working examples that demonstrate how to use the different development tools. It also provides hints and tips that enable you to quickly get up to speed developing converged applications. The portfolio of products include the IBM WebSphere Application Server Network Deployment, IBM WebSphere IP Multimedia Subsystem Connector, IBM WebSphere Presence Server, IBM WebSphere Telecom Web Services Server, and IBM WebSphere Integration Developer. This book is aimed at the diverse set of professionals that design and develop SIP and IMS applications.